Born in Southampton one of at least six children of George and his wife Mary. His father earned his living as a brick burner. In 1891 the family were living in the Toothill area of Romsey, Alfred was the youngest of five children at that time. There was probably a further daughter Rose. After this census the family seem to disappear as there is no trace of either Alfred’s parent of siblings. Alfred was a milkman before enlisting in the 1st battalion of the Hampshire Regiment., at the time of his death he was a Regimental Sergeant Major. He died from wounds received at the battle of the Marne on 22 September 1914. He died in an American ambulance in Paris and is buried at the New Communal cemetery Neuilly Sur Seine on the outskirts of Paris. The First Battalion of the Hampshire Regiment was one of the first in the British Expeditionary Force to land in France on 23 August 1914. Alfred Bennett’s will left everything to his sister Mrs Rose Smith. Alfred Bennett 15th May 1915 © Local World Limited:Trinity Mirror. Image created courtesy of THE BRITISH LIBRARY BOARD. Alfred’s connection to South Holmwood was through his sister Mrs. Knight who lived at “Fernhurst” Holmwood. 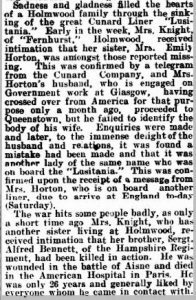 Another sister Emily Norton died when the H.M.S Lusitania was sunk.